Rush hour on Metro tends to be synonymous with things like “Orange Crush” and “Trains Offloaded” and “Why, oh why, did I try to take public transit today? !” While Metro can’t, it seems, fix things like intra-office corruption and driver mistakes, they are trying to do things to make it easier for the general commuter to suffer less. Starting in June, the Orange line will get 6 extra trains per hour (3 in each direction) which will run from Vienna to Largo Town Center, for an 18% capacity boost. The move forks the Orange line into traditional Blue line territory. In addition, the Yellow line will get forked at King Street to include some trains heading to Springfield to increase southbound capacity from the core. Metro has also said that additional “transfer free” options will be coming, but failed to detail them in their press coverage. This would include something similar to the Farragut West/Farragut North walking transfer, but it’s hard to say until Metro makes it clearer. With the Silver Line coming in 2014 (we hope), map changes that include the line out to Dulles Rail have begun in earnest, and a dashed-line extension now splits off from the Orange line to the northwest between West Falls Church and East Falls Church and bears several empty circles where stations will one day go. 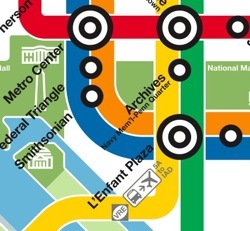 In addition, the market research that WMATA did has sprouted shoots, with new glyphs for buses to the airport, VRE, MARC and Amtrak, and parking options more deftly labeled. In addition, the secondary names of stations are given reduced emphasis in favor of the primary names. In addition, Forest Glen on the Red line gets a hospital glyph (but why not Medical Center?) which is new to the system. The new map is available for public viewing on the WMATA website, and will be coming to a train car near you in the near term. We’ll see if we can get more information about the new transfer options. The last I checked, if you’re looking for medical assistance, most people don’t get to just walk into NIH or Walter Reed’s waiting room and get helped. Given DC’s above average rate of military service, I would say that it would rate an H glyph. According to the map, yellow will extend to Greenbelt during rush. Why is there no consistency for trains going beyond Mt. Vernon Square, even though the current map says they are to go to Fort Totten? There is absolutely no rhyme or reason behind when yellow trains terminate at Mt. Vernon and when at Fort Totten. I frequently return Sunday evenings into DCA (always same flight landing around 9pm) and half the time I can one-seat it to Columbia Heights and the other half I must transfer onto a green line train. What gives?